3-in-1 protection of Antivirus, AntiSpyware and Firewall. ...... technology, blocks malicious websites and prevents spam mails from reaching your mailbox. 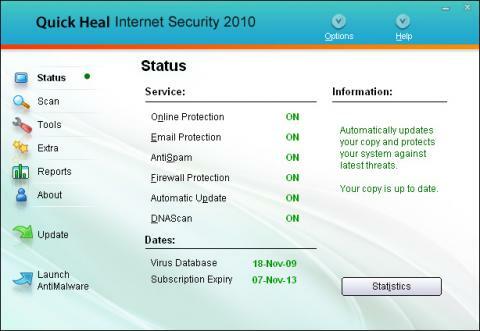 Quick Heal Internet Security 2010 is very low on resource usage and gives enhanced protection without slowing down your computer. Blocks spy wares before they get installed on your PC. Protects your privacy by detecting and cleaning spy wares and blocking their activities of identity theft automatically. Quick Heal Firewall Professional 2.0 powered by Agnitum Outpost locks hackers and thieves out of your PC. Delivers total protection against known and unknown internal and external network based attacks. These will continuously protect your PC from viruses, spy wares and hackers. Qweas is providing links to Quick Heal Internet Security 2011 9 as a courtesy, and makes no representations regarding Quick Heal Internet Security or any other applications or any information related thereto. Any questions, complaints or claims regarding this application Quick Heal Internet Security 2011 9 must be directed to the appropriate software vendor. You may click the publisher link of Quick Heal Internet Security on the top of this page to get more details about the vendor.